Everybody knows that Zombies are hard to kill. The same is true for Canada's system of Supply Management ("SM"). In spite of this, the times are a changing. President Donald Trump has heard about the unfairness of Canada's dairy sector for American exports. He has forced the pending NAFTA re-negotiation. Combine that with the May 2017 loss of Maxime Bernier, Quebec's favorite for the PC Leadership race due to his unwavering plan to kill SM, in spite of Quebec having more SM farmers than any other province. Now, the Montreal Economic Institute has come out against SM. MEI's August 2017 report shows the consequences of SM on the rate of growth and GDP produced by SM and non-SM farmers. The MEI Report is a quick read, just 1 page, so well worth your time. are good enough to compete on world markets, and are rewarded with significant exports. Why can't SM farmers (Chicken, Eggs, and Dairy) do the same? In March 2013 I posted about Canada's sickly chicken exports that were just 1.42% of the total chicken exported by the top 7 OECD chicken exporters. In other words, Canada's market share for chicken exports was a minuscule 1.42%; close to non-existant. Our domestic chicken industry could be 5 times bigger if we left last place, and took our rightful place as one of the leading OECD chicken exporters. In the same post, I outlined how New Zealand's Tegal Poultry has done the hard work to develop a Feed Conversion Ratio ("FCR") 31.9% better than Canadian chicken farmers. Canada's chicken industry used to be a world leader in quality and productivity before SM was invented. Ever since SM arrived, it has been resting on past laurels, slowly sliding into the swamp of mediocrity, where fat, dumb, and happy reign supreme. When the bogus Canadian FCR which artificially boosted the profit of Canadian chicken farmers was finally exposed and corrected, Canada is only 25% behind NZ's world leading FCR. New Zealand ("NZ") used to have Supply Management, but eventually gave it up in Oct. 2011, when economic hard times pushed the NZ nation to the wall. From 1990, NZ dairy exports have grown from NZ$2.1 Billion to NZ$15.5 Billion in 2014. That's up 738%, or an average growth rate of 8.8% per year, doubling and re-doubling in size every 8 years. In the same time period, Canadian dairy exports went from CDN$196.5 Million to CDN$281 Million. That's up 43%, or an average growth rate of 1.5% per year, doubling and re-doubling in size every 47 years. Note that NZ's non-SM dairy system enjoyed 17 times greater growth than Canada's SM dairy system. Here is the greatest cost to Canada and Canadians; the SM imposed loss of opportunity, prosperity, and jobs; punishing all Canadians so that SM farmers, just 0.05% of all Canadians, can enjoy higher profits and no competition. The potentially available growth that Canada could have had was pissed into the wind by SM's dysfunctional thinking and actions. A survey of Canadian consumers was conducted to help define preferences and trade-offs in NAFTA trade negotiations with USA who again complain about Canada's unfair Supply Management system. In a survey by Angus Reid of 1,512 Canadians during June and July, 2017 just 4% of Canadians claim to understand a lot about Supply Management ("SM"). However, even this handful of self-proclaimed SM experts were confused about which food commodities are controlled by SM (ie. incorrectly including beef & pork under SM). 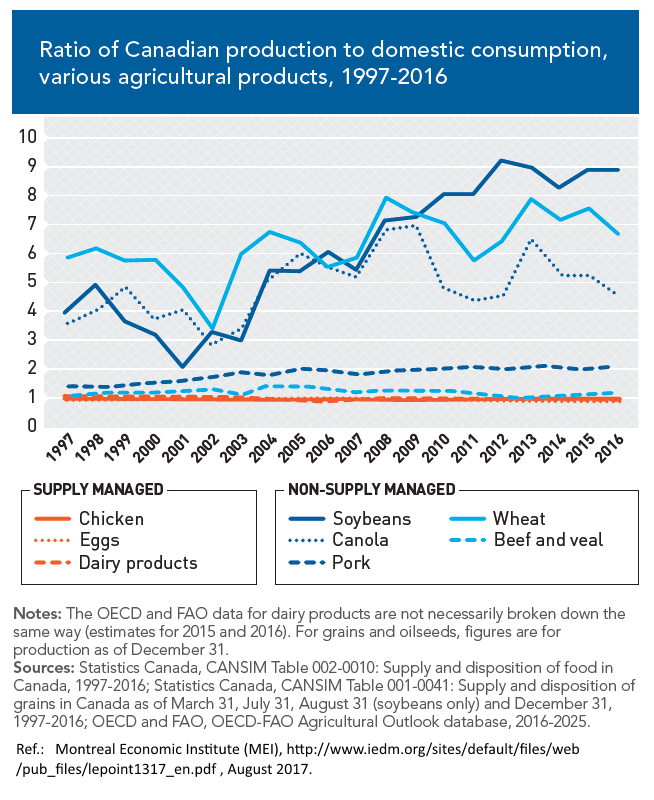 Worse, 52% of Canadians believe beef is supply managed, when it is not; and 51% of Canadians believe milk is not supply managed when in fact dairy represents about 80% of the entire system. Based on this confusion, any survey that shows support for SM by Canadian consumers is a misleading mirage promoted by SM snake oils salesmen who have a pay cheque to protect. 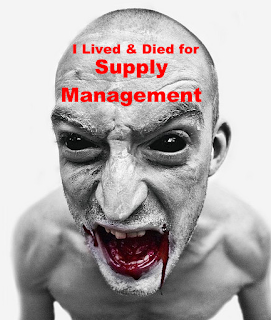 For detailed results based on knowledge of supply management and support levels, click here.